Christians often spend time arguing that Jesus rose, but we forget to appreciate why it actually matters. In the follow-up to his brilliant book on the cross, Passion, pastor and author Mike McKinley considers the revolutionary consequences for each of us of Christ's resurrection, ascension and the sending of his Spirit. Walk through Luke 24 and Acts 1-2 and discover how the reality that Jesus lives can and should change every aspect of our world. Whether you're a new or a long-time Christian, let the joy, peace, confidence and purpose of the resurrection flood into your everyday life. About "The Resurrection in Your Life"
Christians often spend time arguing that Jesus rose, but we forget to appreciate why it actually matters. In the follow-up to his brilliant book on the cross, Passion, US pastor and well-known author Mike McKinley considers the revolutionary consequences for each of us of Christ's resurrection, ascension and the sending of his Spirit. Walk through Luke 24 and Acts 1-2 and discover how the reality that Jesus lives can and should change every aspect of our world. Whether you're a new or a mature Christian, let the joy, peace, confidence and purpose of the resurrection flood into your everyday life. Mike McKinley is the author of Am I Really a Christian? and Church Planting is for Wimps. He is Sr. Pastor of Guilford Baptist Church in Sterling, Virginia. 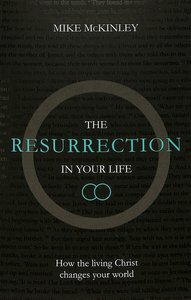 Customer Reviews For "The Resurrection in Your Life"
This is a book to be savored - that is why it is taking me a while to get through it. There is so much truth to be applied to our lives and the insights help us to identify with people in the Bible. I highly recommend it and think it will enrich the lives of both young and old.